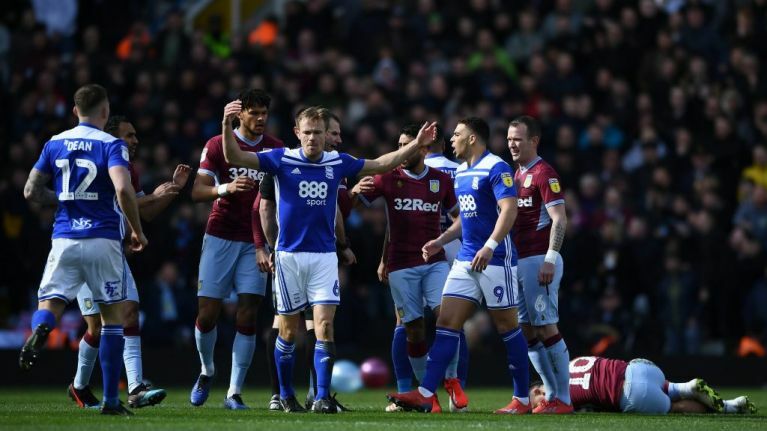 "What happened has no place in football or society"
Birmingham City have released an official statement apologising to Jack Grealish and Aston Villa for the attack on Grealish by a Birmingham fan during the Second City Derby on Sunday. Grealish was attacked within the first 10 minutes of the game at St. Andrew's, after the supporter ran from the corner flag and struck the midfielder from behind. The fan was subsequently arrested by police at the crowd, and there have been calls for both a lifetime ban for the fan and a stadium ban for Birmingham in the aftermath. Birmingham released a statement after the game, in which they condemned the behaviour of their supporter and offered their full apologies to Grealish and Villa. "Birmingham City Football Club would like to apologise to Jack Grealish and Aston Villa Football Club for an incident in this afternoon’s derby match," reads the statement. "We deplore the behaviour of the individual who committed this act and rest assured he will be banned from St. Andrew’s for life. The Club will also support any further punishment this individual may face in the eyes of the law.